Modal windows, dialog boxes, modal pop-ups, pop-overs, pop-unders, whatever you want to call them, they all have a reputation for being divisive when it comes to usability. However, judging by the frequency of websites using pop-ups, it looks like the designers and developers love them. On the other hand, the users seem to be quite reluctant to popups, especially to the ones that are blowing up right in your face the moment the web page you intended to read shows up. Despite all this positivity or negativity around the pop-ups, I decided, however, to try them out in combination with the classic “blog + lead magnet” lead generation model, at the same time making them as least intrusive as possible. Some WordPress plugins dealing with popups are treating these UI elements the same way as widgets that can be automatically inserted in various places on the page, like inside posts, page header or footer, sidebar, etc. But this article is about true pop-ups, the ones that are temporarily interrupting the normal user workflow. The pop-up triggers when the user has finished reading the article, so it’s not disruptive at all. So, a pop-up with exit intent trigger is by far the least intrusive way of grabbing users attention inviting them to opt-in. Oh, in case you are not fully clear about what “exit intent trigger” really means. It’s just a “normalized” name for a JS script detecting when the mouse pointer is moved towards the upper border of the browser window right before reaching the edge, which can be interpreted as an intention of leaving the site. There are plenty of WordPress plugins out there serving this purpose but most of them are offering exit intent trigger as a premium extension. Lately, I tried to find a free one during several search sessions, but only two weeks ago finally found not one, but two: “PopupAlly” and “Exit Popup”. PopupAlly it’s a free WP plugin with premium extensions, but the feature that I was after, exit intent trigger, is fortunately included in the core free plugin. The premium version has many features that are missing in the free version, obviously, such as AB split testing, statistics, unlimited pop-ups instead of only two, and many other advanced settings. 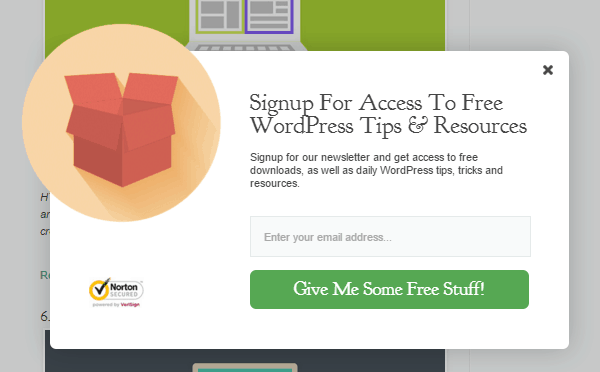 But if all you are after is one exit intent popup showing an opt-in form, this plugin is doing its job pretty well. The free version includes also filters to determine on which pages or posts to display the pop-ups, as well as display frequency control. Exit Popup is a very basic free plugin designed for one simple task: sitewide display of one single popup with exit intent trigger and custom content. No extra functionalities are included, other than display frequency control. This plugin is, in fact, taking advantage of a functionality that is already implemented in the jQuery JS library, which is used by the majority of WP sites anyway. I’m sure you would like to see some statistics here, but unfortunately, the system I put in place on this blog is very recent. Anyway, when such statistics will be available, I’ll publish it for certain. These findings took me quite a long time and I’m anxious to learn about other pop-up plugins out there that include an exit-intent trigger as a free feature. If you have knowledge about other such plugins, please leave a comment so that everyone reading this post could benefit from the information.